Geodesign tools can be used to support collaborative processes. Typical tools combine different methods, such as simulation models, spatial multi-criteria analysis, visualization, and optimization. User-friendly interfaces allow multiple users to provide input and generate real-time output to support negotiated spatial decisions. 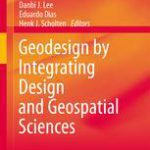 Geodesign can be defined as follows: “Geodesign is a design and planning method which tightly couples the creation of design proposals with impact simulations informed by geographic contexts, systems thinking and digital technology “(Steinitz 2012, p.12). 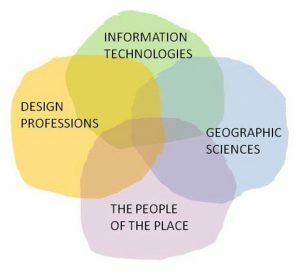 Geodesign combines the knowledge of local stakeholders (the people of the place) with contributions design professionals, Information technology and geographic sciences. A nice and simple example of geodesign is shown in the movie below. The task is to locate recycling containers in part of Amsterdam in such a way that the walking distances to these containers are minimized. The colours indicate the distance to the nearest container. The movie shows how the local expert finds the best location for five containers by moving these containers around on a touch screen. In a recent project we applied our experience with geodesign in data rich environments such as the Netherlands and the UK to design an approach for interactive workshops in the Lower Zambezi valley, Mozambique. Instead of a model based application that provides real time response to proposed changes, we designed a tool that facilitated open discussion and relied heavily on visualization. This approach required no calculation steps (the local stakeholders provided the input) and relied heavily on drawing and icons. This appealed to the participants and the absence of a quantitative model was not seen as a problem. Despite the simple strategy, the tool served its purpose well. It was interesting to observe that we were able to use the principles of our more sophisticated tools in an approach that was simpler, but also much more graphical in order to promote discussion and understanding. In GIS Magazine nr. 8 besteedt redacteur Remko Takken aandacht aan de Geodesign Summit Europe, gehouden afgelopen oktober in Salzburg. De Nederlandse inbreng was groot. Natuurlijk was ook het SPINlab van de Vrije Universiteit Amsterdam vertegenwoordigd. HERWIJNEN – Heel Nederland nabouwen in de virtuele werkelijkheid, dat start vandaag in het GeoFort in Herwijnen. Het landelijke Minecraftproject is het initiatief van het GeoFort. Met behulp van echte gegevens van het Kadaster en Rijkswaterstaat kan iedereen vanaf vanmiddag Nederland virtueel gaan inrichten.